Ironically, Trueplay tends to make the Play:1s sound more like the Playbar, which stands on its own without Trueplay capability. I would conclude from this that Sonos has a target in mind (Trueplay is aimed at achieving that target), and that target doesn’t match my own. In my years in the audio business I’ve worked with some great speaker designers – I am sure they would understand what I mean. So my experiment starts with a Connect:Amp because I need an audio input to the Sonos ecosystem. The Connect:Amp has a stereo analog input, as does the Play:5 (original and current generation). 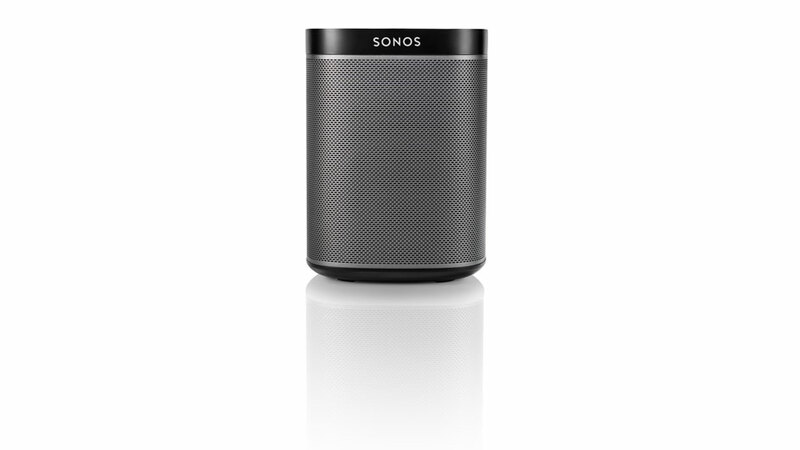 Connect the analog audio output of your TV to the Connect:Amp audio input, and in the Sonos set-up configure this “line-in” source to be available to your Sonos system. Place a stereo pair of Play:1s on either side of your TV, and set them to the line-in source. You now have a pair of Play:1s playing your TV sound. To my ear, this is a far better option that a Playbar. The Play:1s sound like hifi rather than a loud television set. it proves to me that better sound CAN come out of a box marked Sonos. Yes, beyond just costing you a Connect:Amp to be your analog-to-digital convertor. First, this setup has the longer latency (delay time through the network) that Sonos avoids by giving the Playbar its own TV-optimized input. You probably will notice this on some video sources, if they were correctly lip-synced in the first place. Second, the Play:1s won’t be responding to your TV remote control the way a Playbar would. But it sounds pretty darn good! Hope you enjoyed the experiment! This entry was posted in Product Design, Reviews and tagged Play:1, Playbar, Sonos by Stephen. Bookmark the permalink. Why not use just the connect? Use the connect to do what exactly? … to use the optical port on your Sonos connect? Hi Stephen, good article. Is the longer latency through the network distinctly noticeable or does it depend on the video source. I have 2 play 1’s and would invest in the connect amp but only concern in the video sound sync. I guess it depends on how sensitive you are to latency – it’s a common issue on modern TV Audio systems – and sometimes it’s the fault of the delivery channel (i.e. your cable company). If you find yourself noticing lip sync issues routinely, you will definitely notice the the latency here. Hi Stephen, interesting series of articles. Can a connect be used in place of connect:amp since it has a set of stereo inputs as well? If so, any advantage of using connect:amp over connect. Seems like Connect or connect:amp are being used to get the audio into sonos network, so can this be achieved using a play5’s audio input as well? With this setup we’ll be always limited to Stereo even if the TV or whatever the source gives you 5.1, is that correct? I was thinking of pitching in for a playbar before I saw your article, now I’m rethinking the setup. I have a play5 and was planning to invest in a playbar and sonos sub that’ll be shared between playbar/tv and play5 for music. I appreciate any suggestions from an expert such as you. Hi there… thanks for the comments and questions. First I want to emphasize my suggested set up is a bit of a kluge (as it doesn’t support adjusting volume from a TV remote, and it likely gives you a lip sync issue). Second, yes the line input on either connect model or on the Play:5 will work the same. Third, you will be limited to a stereo mixdown of your 5.1 source. The last point is important because it breaks a rule of cinema sound by not having a discrete center (which the playbar does have) — so I recommend not spacing the play:1 speakers too widely. That all said, I think it will sound pretty good; you just have to understand the pitfalls of this arrangement.